Help regarding GSA Option — . :: GSA SEO & Marketing Forum ::. Can someone help me to explain what is that means? if you use proxies and these proxies are unstable (e.g. 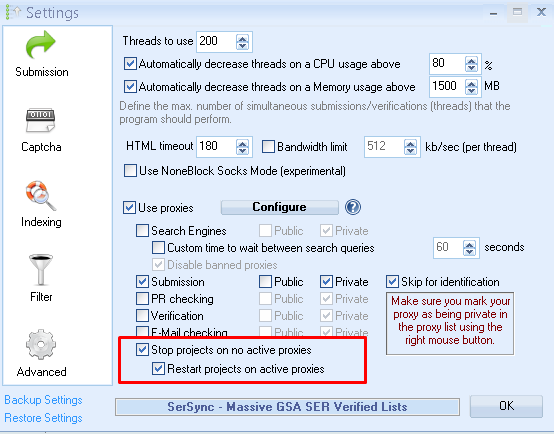 public scraped proxies), you often end up with SER disabling them (check proxy options on CONFIGURE dialog). So if none of them is left, you would waste a lot resources. This can be avoided if you use these two options. SER will stop the project and if you get to the point where the proxies are back online or you find new proxies, it restarts the projects previously having stopped.